The University of Notre Dame has completed installation of the new Sarah L. Krizmanich Telescope on the roof of the Jordan Hall of Science. The telescope, which features a 0.8-meter (32-inch diameter) mirror, will be especially useful for undergraduate astronomy research. The light collecting area of the mirror makes it one of the largest telescopes in Indiana. Notre Dame has a long history with astronomical telescopes. A 6-inch aperture lens was a gift from Emperor Napoleon III to the University in 1867. 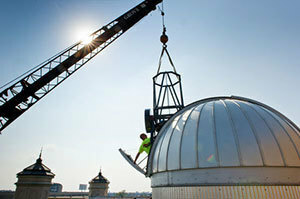 It is now the objective of a 1890-era telescope housed in a modern dome atop the Nieuwland Science Hall. Notre Dame also is a partner in the Large Binocular Telescope (LBT) project in Arizona. The LBT is the largest telescope in the world on a single mount. The Krizmanich Telescope will provide undergraduate and graduate students with a cutting-edge astrophysics research experience combined with the convenience of remaining on campus. The Krizmanich Telescope also will be used to test new instrumentation being developed by the University’s Department of Physics. Community outreach events and cooperative observing with local astronomy groups are planned. Originally published by William G. Gilroy at news.nd.edu on September 24, 2013.